Chiyoda Outer Palace - Following his successful "Chiyoda Inner Palace" series, Chikanobu designed a second triptych series first published in 1897 illustrating the "Chiyoda Outer Palace" (Chiyoda no on-omote), the domain of the shogun and his retainers at Edo Castle, also known as Chiyoda Castle. The men are depicted taking part in sporting and hunting activities, martial arts, annual ceremonies, and traditional rituals. The Outer Palace series was smaller than the Inner Palace series, with 32 triptychs instead of 40, and these designs are seen much less often. 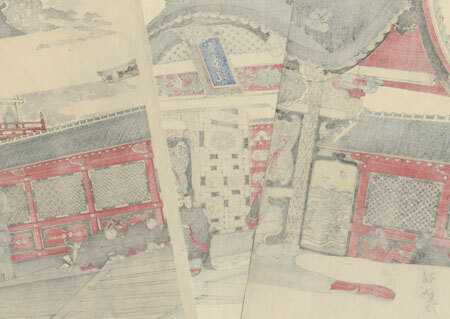 Chikanobu's characteristic attention to detail highlights the clothing and accessories worn by the samurai, as well as the indoor and outdoor settings. Many designs include deluxe printing techniques such and embossing and burnishing. The handsome "Chiyoda Outer Palace" series provides a wonderful look at life inside the Shogun's castle prior to the Meiji Restoration. 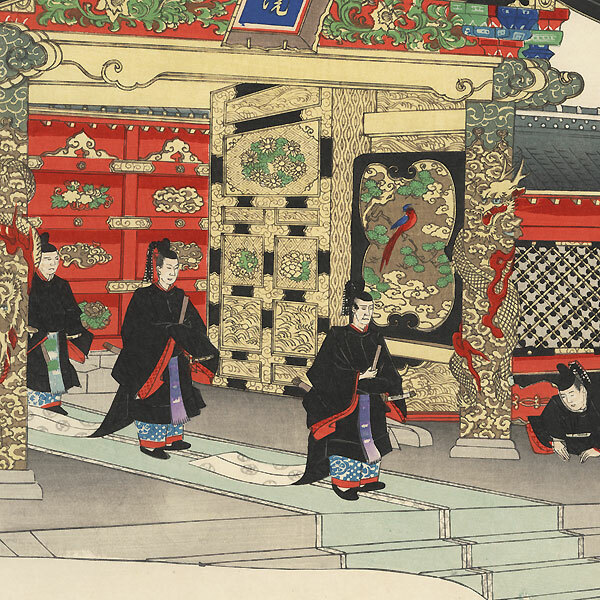 Visit to Zojo Temple at Shiba, 1897 - Beautiful Chikanobu triptych of a dignified procession of samurai passing through a large ornate entrance gate at Zojo Temple in Shiba. Noblemen bow respectfully on either side of the entrance as men in formal court dress slowly file through. Elaborately carved pillars with dragons and clouds support the curving tiled roof, the building extending on either side of the doorway. Beautiful architectural detail with burnishing on the black lacquer elements, and a faint burnished scroll pattern on the black kimono. An outstanding Chikanobu design. Condition - This print with excellent color and detail as shown. Three separate panels. A few creases and small marks. Please see photos for details. Good overall.